Students study the principles and techniques of genetic and bio-engineering that are critical to every aspect of our daily lives. Microbiology student preparing petri dishes for lab. Much of the first semester is spent learning to prepare solutions and media for microbial growth so the resulting microbial colonies can be analyzed and manipulated. CASEE students are asked to prepare their own media whenever possible so that when students exit the course they can enter the work force with this valuable skill. Gel loaded with dye extracted from popular candies to compare to reference dyes. 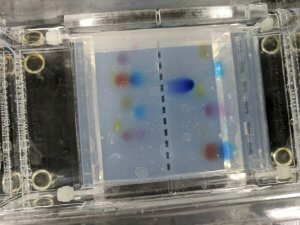 DNA electrophoresis is a simple yet essential analysis technique. Once students have learned to prepare their own gels and solutions they investigate the principles of electrophoresis by analyzing the different dyes found in their favorite candies. This knowledge is them applied to more advances concepts including DNA fingerprinting and restriction enzymes. CASEE students have planted several species of native plants to fundraise for the program and promote the use of native plants in landscaping. CASEE teams up with NatureScaping who will be selling bare root trees, shrubs, perennials and bee cocoons at the same in the same place. Join us to get some great deals on great plants! More information is available at www.naturescaping.org. Call us at (360)885-5300 or send us an email for more information.